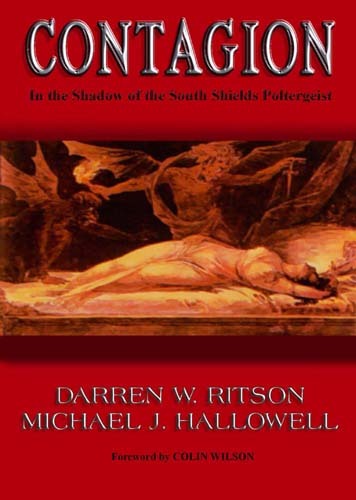 Almost ten years on after the famous South Shields Poltergeist case of 2006, and its disturbing book of 2008, Darren W. Ritson and Michael J. Hallowell bring you Contagion, a fascinating and ground-breaking new study of the world of poltergeist activity. After researching a number of different and bewildering poltergeist cases, post-South Shields, the authors have come to some startling conclusions and raise some serious thought-provoking hypotheses regarding the aspect of poltergeistry known as 'contagion'. Contagion is one of many facets of the poltergeist phenomenon and, if it so desires, can touch all those that choose to investigate it - no one is safe. During the years subsequent to the South Shields case, both authors were subjected to poltergeist 'contagion' which, after studying these events and further cases, brought them to conclude that they may not have been as free of the South Shields entity as they had previously - and somewhat naively - thought. This book was originally completed and ready for publication in 2009, but due to unforeseen circumstances and situations out of the authors' hands, they decided to wait until now to release these new accounts, along with hitherto unpublished material and photographs pertaining to the 2006 case. With a foreword by the late Colin Wilson (1931-2013) this book promises to be one of the most controversial paranormal publications of recent years and create some serious debate about the nature of the poltergeist phenomenon. Darren W. Ritson has written almost twenty books on ghosts and hauntings and has been a member of the Incorporated Society for Psychical Research (SPR) since 2006. Darren has travelled the country lecturing on the poltergeist phenomenon and has been invited to conduct talks with some of the leading academic research associations into psychic study such as the SPR, the Ghost Club of Great Britain and the Scottish Society for Psychical Research (SSPR). Darren has also lectured at Northumbria University after receiving invites from Dr Nick Neave (Head of Psychology/Parapsychology). Michael J. Hallowell is the author of over a dozen books on the subject of paranormal phenomena. He is a freelance journalist and broadcaster and lectures widely on subjects such as the supernatural and comparative religion. In 2011, long after completing the manuscript for Contagion with his co-author Darren W. Ritson, he began to study the history of the Jinn phenomenon and as a result converted to Islam. He is now a practising Muslim and is currently working on a number of books, including an in-depth study of the crucifixion from an Islamic viewpoint. Free UK delivery; Orders for USA and Europe please add 5.00 GBP - all books sent by Air Mail.